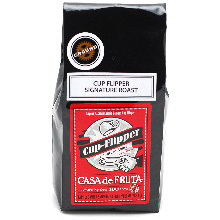 The famous "cup flipper" of yore is long gone, but there is still good reason to stop in at Casa de Fruta! "The Cup Flipper not only kept us entertained, but he "perked" us up with delicious coffee to keep us safe on the remainder of our long road trip." Try a cup today! Packaged in a 10 oz. bags. From Anonymous of Clovis, California on 6/24/2018 .